The first batch of 90 flying cars is ready for production and out of those 90 only 25 will be coming to North America. Flying Car, “The Liberty” will cost $599000 for one unit. PAL-V is accepted to deliver the first set-to North America by 2018. The full production model of The Liberty limited pioneer Edition will be unveiled in early 2017. A working model was already built and tested in for flying in 2014 and it was a success. The very first vehicle proved the competence of PAL-V and that how effectively it will be able to comply with the prevailing norms of air and land regulations in the markets of Europe and USA. The Company will first get it certified in Europe and then in America. The car will be holding a maximum capacity of 2 people with a side by side arrangement of seats. The details of the engine used are not revealed yet but the company is saying that it Has used a double redundant DRIVE ENGINE i.e. a certified airplane engine produced by a leading manufacturer. The engine has a capacity of 200 horsepower and can drive the Liberty at an amazing speed of 106 mph on land and 111 mph in the air. It will require a minimum speed of 31 mph and a 540 Feet long runway to take off, while just 100 Feet long runway is needed for landing. 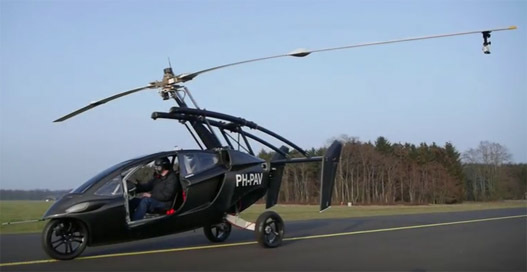 Though, it somewhat gives the look of a small helicopter, The PAL-V is a gyroplane which is different from a helicopter. A Gyroplane drives the engine through a propeller for thrust while the top rotor is driven by the air passing through it. A Gyroplane drives the engine through a propeller for thrust while the top rotor is driven by the air passing through it. The company believes that this makes it easier and safer to fly, since this type of structure is not much affected by cross winds. And if we compare it to a fixed wing plane we see that Pal-V would be experiencing only 20% of its turbulence, this is what makes it better. Also a special license is required to fly the PAL-V. The PAL-V, gives the experience of riding a Motorcycle while on the road because of its tilting feature. The dash of 0 to 60mph will come within 10 seconds only when the distance covered would be 750 miles. It will take only 5 minutes to convert the Car from flying mode to the driving mode. So at the end we can see the Company has tried to provide The Liberty with all the features and comforts. It could and it will be a great gift for the fans of Flying car who might by now will be planning and saving to buy this amazing car and fulfill their dreams of flying.